Founded in 1973, Charles Schwab is an iconic brand with which most investors are familiar. The full-service broker is home to $3.25 trillion in total client assets, and provides services ranging from stocks, options, and futures trading to full, FDIC-backed banking services, to comprehensive retirement solutions. In total, Charles Schwab serves 11.6 million active brokerage accounts, 1.3 million banking accounts, and 1.7 million retirement plan participants. Charles Schwab’s focus is seeing the world “Through Clients’ Eyes,” which means delivering products and services customers want and leading industry trends, instead of following them. 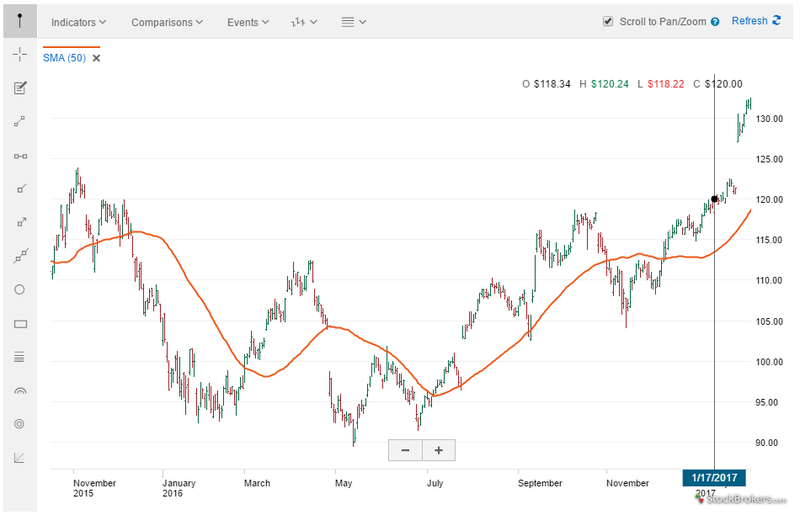 For those seeking access to low costs, excellent research, quality trade tools, and professional planning for the future, Charles Schwab will not disappoint. StreetSmart Edge platform is easy to use and feature rich. Primary mobile app does not include real-time streaming quotes. For trading stocks or options, Charles Schwab is ahead of most of its closest full-service competitors. 503 commission-free ETFs offer customers ample opportunities to invest with no charge. 3,422 NTF (no transaction fee) mutual funds. Alongside Fidelity, Charles Schwab is the only broker to list the price improvement received on eligible orders. Like other full-service brokers, Charles Schwab charges higher margin rates. Mutual fund trades outside of Schwab’s 3,422 NTF (no transaction fee) funds lineup cost $49.95 per purchase ($0 to sell). 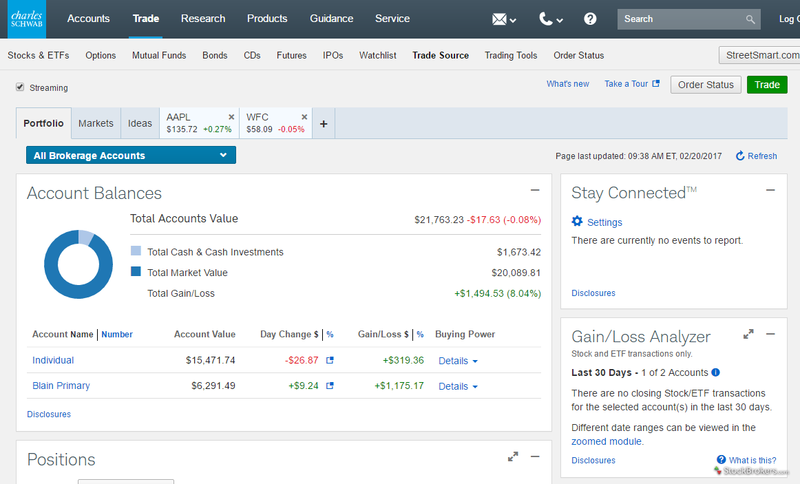 Charles Schwab provides among the highest quality of research of all the brokers I've tested here at StockBrokers.com. Schwab’s in-house research is terrific, thanks largely to its 25 staff experts, including Liz Ann Sonders, Randy Frederick, Lee Bohl, and Kathy Jones, who consistently produce institutional quality research. Beyond offering traditional third-party ratings, Schwab’s proprietary equity ratings add value to the research experience. 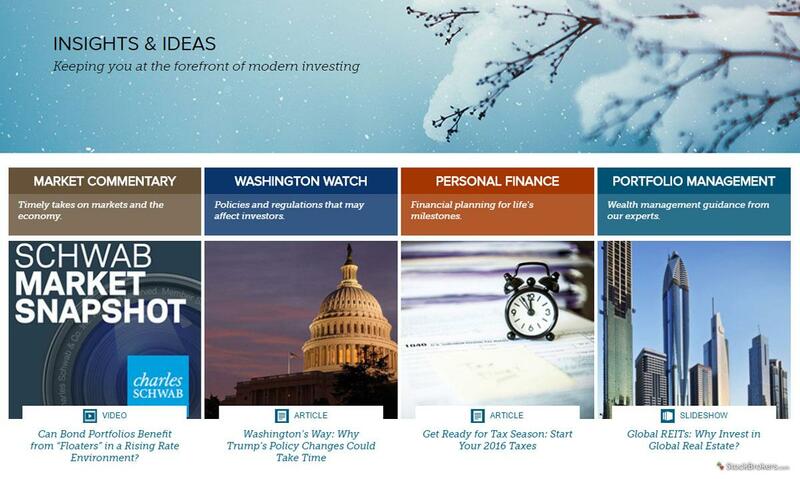 Schwab Live streaming events and market commentary are frequently fresh and engaging. Daily broadcasts are offered, a feat matched only by TD Ameritrade. Schwab’s research needs to freshen up its design, which is not as intuitive as Fidelity's, although on a purely feature-by-feature tally, both provide nearly identical offerings. 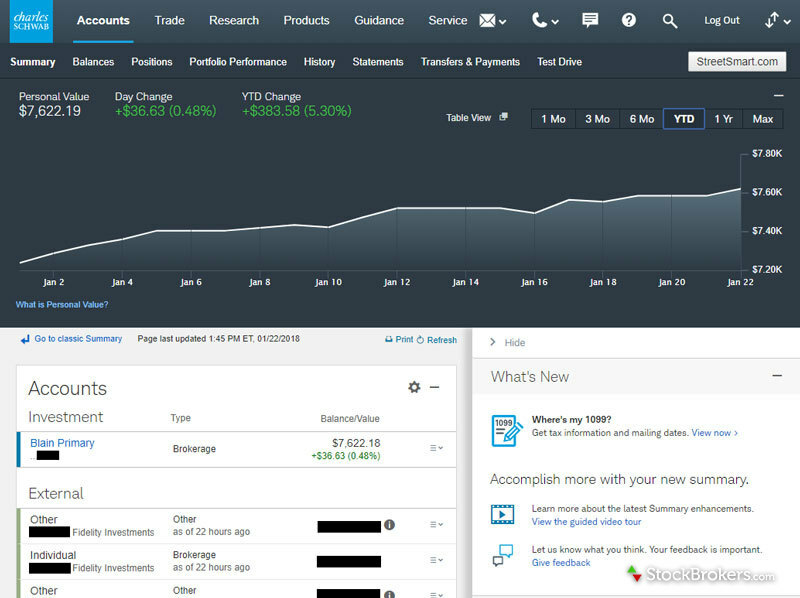 Charles Schwab currently offers customers access to three platforms: StreetSmart.com (web based; everyday investors), StreetSmart Edge (desktop based; active traders), and StreetSmart Central (web based; futures trading). While each platform has its highlights and lowlights, all in all, Schwab does a good job and will satisfy most customers. 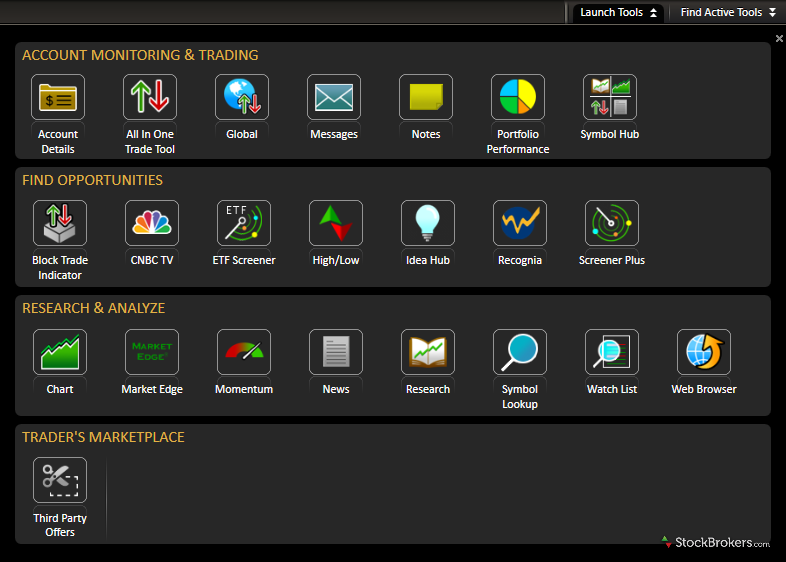 StreetSmart Edge provides most of the bells and whistles active traders need to succeed. 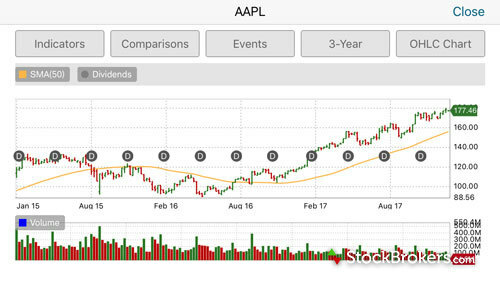 I find the platform easier to learn than say TD Ameritrade and TradeStation, although the latter two provide a richer experience overall. 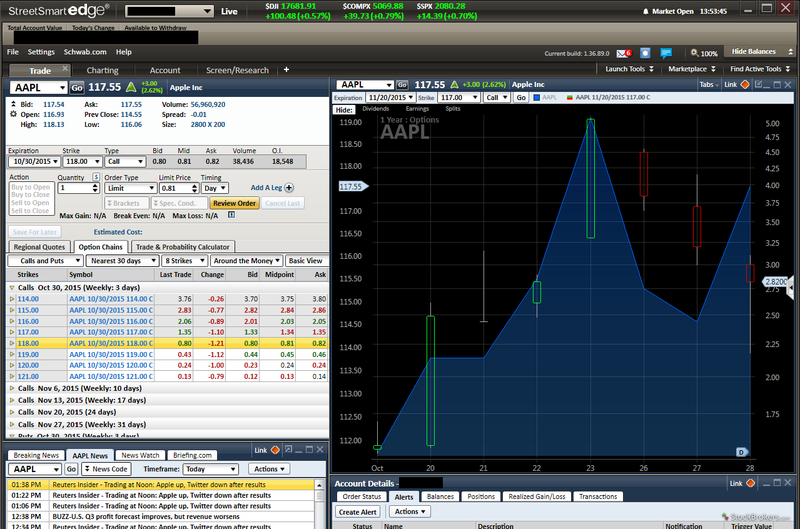 The Proprietary Walk Limit order type is great for options traders. The StreetSmart.com platform is way overdue for a design and functionality overhaul. The StreetSmart Edge platform is not the fastest and isn’t ideal for traders looking to stream, say, 10 stock charts at once across multiple monitors. 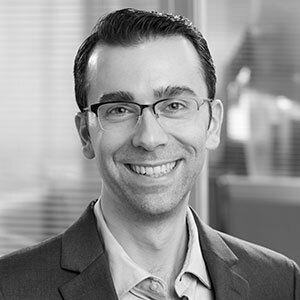 Charles Schwab provides a consistent and generally enjoyable experience, regardless of the device; however, its mobile apps lack core functionality in two key areas: alerts and quotes. Full support for trading everything from stocks to mutual funds and complex options. Idea Hub is unique to Schwab mobile and makes filtering options ideas a breeze. No basic stock price alerts can be set. Quotes are in real time but require manual refreshing. 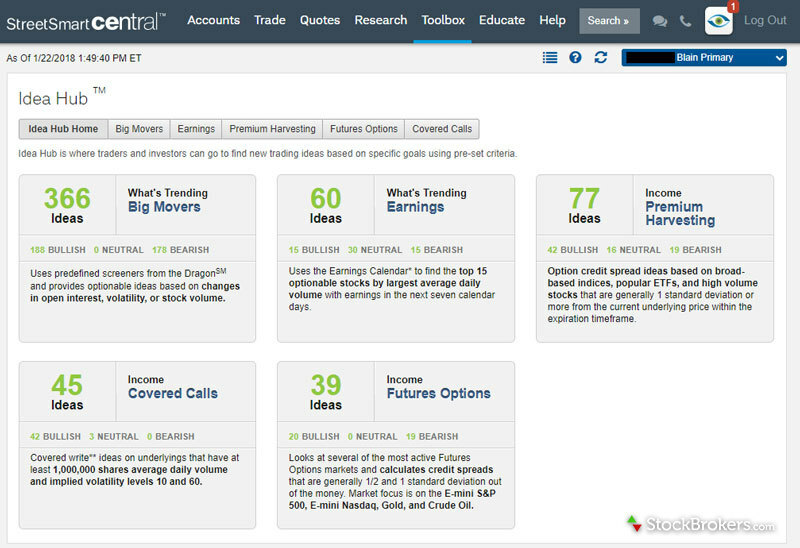 Watch lists auto refresh once every ten seconds, whereas Schwab’s closest competitors all offer streaming quotes. Like other full-service brokers, Schwab delivers a full suite of products and services. Charles Schwab provides a full offering, from stock and options trading to fixed income and retirement guidance. Futures trading must be conducted on the StreetSmart Central platform. Among the bank and brokerage combinations in our annual review, Charles Schwab offers a full suite of services, and competes with the best in the industry. Charles Schwab is a registered member of the Federal Deposit Insurance Corporation (FDIC), which insures bank deposits up to $250,000. No loyalty rewards offered for using multiple products, which is where Bank of America Merrill Edge reigns supreme. Charles Schwab delivers a thorough educational experience that will satisfy most investors. All investing topics covered, from stock trading to retirement. At least 50 free webinars offered each month to current customers. Webinars are also archived for viewing on demand. No progress tracking available to track what educational content you’ve completed or where you last left off. No interactive learning tools, such as quizzes, are provided. Charles Schwab is a respected worldwide brand with a very balanced offering. Customers have access to a plethora of quality research and innovative trade tools, not to mention low trading costs alongside several hundred commission-free ETFs and thousands of commission-free mutual funds. Find out how Charles Schwab stacks up against other brokers.